Valles Marineris, the "Grand Canyon of Mars," sprawls wide enough to reach from Los Angeles to nearly New York City, if it were located on Earth. The red outline box shows the location of a second, full-resolution image. Everwanted to explore the surface of Mars? Now you can ? at least virtually - thanksto a powerful camera aboard a spacecraft in orbit around Mars that has made themost accurate global map of the red planet in history. Acamera from NASA's Mars Odyssey spacecraft captured nearly 21,000 images using its ThermalEmission Imaging System, or THEMIS, a multi-band infrared camera. The imageswere stitched into the new Mars map, which was posted online by researchers atArizona State University's Mars Space Flight Facility in Tempe, Ariz.
"We'vetied the images to the cartographic control grid provided by the U.S.Geological Survey, which also modeled the THEMIS camera's optics," said PhilipChristensen, principal investigator for THEMIS and director of the Mars SpaceFlight Facility, in a statement. "This approach lets us remove allinstrument distortion, so features on the ground are correctly located towithin a few pixels and provide the best global map of Mars to date." Userscan pan around the mosaic of images, and at full zoom, can view the smallestsurface details, which appear 330 feet (100 meters) wide. Previous areas of Marshave been mapped at higher resolution, but this new map provides the mostaccurate view so far of the entire planet, researchers said. Viewerswith large bandwidth, powerful computers and software capable of processingimages in the gigabyte range can also download the full-resolution map insections. "TheMars Odyssey THEMIS team has assembled a spectacular product that will be the base map for Mars researchers for many years to come," said Jeffrey Plaut,Odyssey project scientist at JPL. "The map lays the framework for globalstudies of properties such as the mineral composition and physical nature ofthe surface materials." 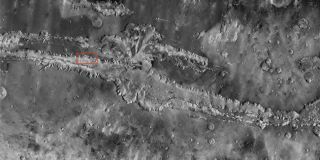 Severalsites, including NASA's "Be a Martian" website also allows the publicto lend a hand and contribute to Mars exploration by aligning the images to within a pixel's accuracy. "Thebroad purpose underlying all these sites is to make Mars exploration easy andengaging for everyone," Christensen said. "We are trying to create auser-friendly interface between the public and NASA's Planetary Data System,which does a terrific job of collecting, validating and archiving data." TheMars Odyssey spacecraft was launched in April 2001 and reached Mars in October ofthat year. The mission is managed by NASA's Jet Propulsion Laboratory. Thenew map of Mars released by the Arizona State University's Mars Space FlightFacility can be seen in its entirety by clicking here. ?